This is one of those rare pieces that actually has personal content. The Blog is primarily a starting point for discussion of recent events from a business, economic and political perspective. However, on a recent visit to my home city of Liverpool, I went to take a closer look at the standing sculpture of Antony Gormley’s “Another Place”. Feelings have been high over this installation; feelings that it has little or nothing to do with the industrial heritage, indeed commercial present, of today’s Liverpool. In this photo, we see a serene and beautiful panorama. If one does a 180 degree turn, you will look directly towards the brute commerce of Liverpool’s container docks. What was the centre of maritime commerce not only for Great Britain, but for the world. At the start of the 19th Century over 40% of the world trade – and more than this by way of value – was passing through Liverpool. 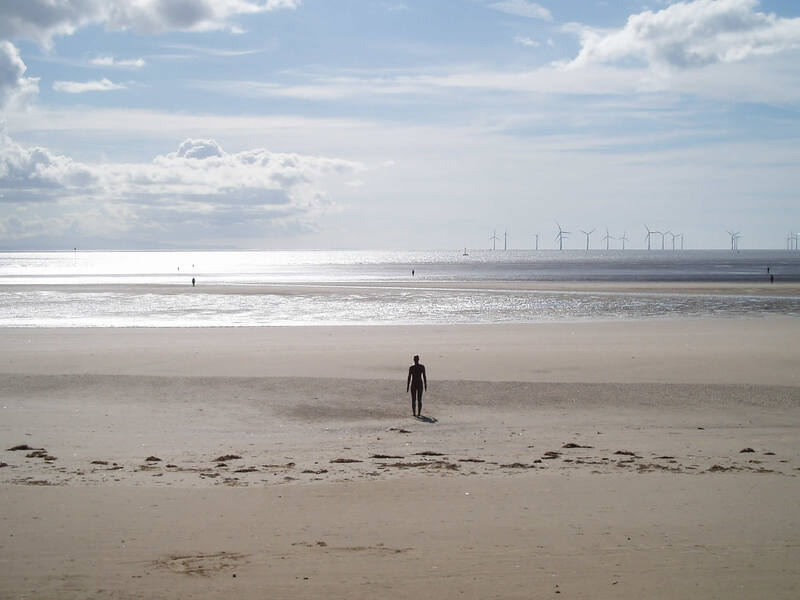 What, other than gazing at times past, does Antony Gormley’s iron men signify for Liverpool? Well, I would argue that this isn’t the point. I know this beach profoundly well – in fact here on this website it shall first publicly be cited as “my beach” (I claimed ownership approximately aged 8). I grew up here and knew every eddy, the tidal reach, the coldness of the water and the danger of the sands. I am uniquely qualified to say that this stretch of land has never looked so good. The high power wind turbines in the distance are precisely indicative of the fact that Liverpool is very much part of the modern world. Out of shot to the right of this, further out in Liverpool Bay, sits a large incandescent gas rig. One energy source replaces another: Liverpool becoming critical as a centre for the UK offshore energy industry. New industries of multimedia, stemming from Liverpool’s centres of excellence at two of its three universities – another important revenue and creative force for the city – and television production through Granada Studios, show that perhaps the city has finally turned a corner. Few people would believe that Europe’s largerst property development project has just been completed this summer at “Liverpool One” a gargantuan shopping and office complex, generating thousands of new jobs. For the lower skilled there is now employment in call centres dotted around the city, themselves leading change in what had previously been a criticised work environment, but one that has the capacity to soak up many of the displaced workers from the city’s heavier industrial past. With European Capital of Culture 2008 also now securing a strong and proud base from which to venture, back into the whole of the world that was originally only accessible from this port.